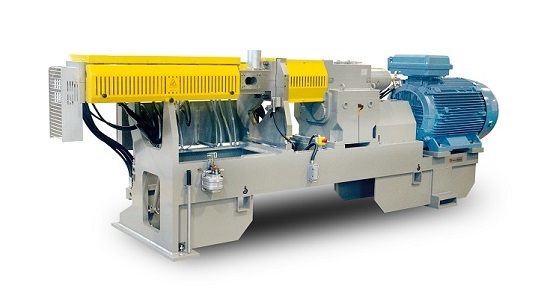 When considering the best way to achieve the maximum throughput from a new powder coating extruder it is tempting to believe that a smaller extruder with a more powerful motor can match or exceed the output of a larger machine with a smaller motor. It sounds plausible; but closer examination of the process shows not only that increasing the power of the main drive fails to boost output, but that it is actually counter-productive. Output is not determined solely by power, as some of our competitors claim. Ultimately, the rate-limiting factor is feeding the virgin pre-mix into the extruder. This is determined by the infeed design and, critically, the free volume of the barrel and screw elements. Increasing the feed rate and expecting that the extra power will push it through is like trying to force a quart of sand into a pint jar by using a bigger hammer. Material starts to bounce off of the feed screws and back up the feed throat; power spikes occur due to product surging through the barrel and product quality deteriorates. Baker Perkins views powder coating as a specialist application and designs extruders specifically for it, choosing the optimum power needed for the process. Competitors’ machines are frequently multi-purpose, and powered for the most demanding application – often plastics with high energy requirements. We have many real-world examples of our extruders matching or exceeding the output from competitors’ more powerful extruders. At one powder coating plant on the west coast of the USA, we obtained run data from a competitor’s 56mm extruder and our 65mm machine, running the same black epoxy coating. The results showed a dramatic difference in throughput and energy used to process the formula. The competitive machine used 0.165kW per kg, producing 346 kg per hour; the Baker Perkins machine used 0.082kW per kg, producing 435 kg per hour. In fact, Baker Perkins’ extruders use very little energy: on average between 0.06 and 0.08kW to produce a kg of product. Many functional coatings require only 0.04kW per kg. The 56mm machine had a motor 50% more powerful than the Baker Perkins MP65. The competitor had incorrectly told the customer that their smaller extruder could keep up with our larger machine because of its higher power. The competitive machine is using twice as much power per kg, and producing 90kg less per hour. Often the throughput gap between our larger extruder and our competitor’s smaller extruder is far greater than 90kg. The extra energy raises the temperature of the product and has to be removed by the cooling system. Not only does that waste money – twice - but it also causes quality problems by increasing the likelihood of hotspots and pre-curing of the product. Having an over-powered extruder can have a severe detrimental effect on running costs due to poor quality, excessive wear, increased energy consumption and process instability. It makes sense to choose a machine with the optimum power and barrel size for the application.